The Aquatronic Auto Roller comes with a control package for ease of use, reliability and economy. No hard wiring required, plugs directly into the mains. Trickle charge battery fitted to allow continuous supply in the event of a power disruption. Lock out on front of control panel to eliminate unwanted use. Thermal cut out to protect motor and prolong life. Easy to read and use LCD display. Operation from control panel or radio remote key fob, with remote key switch or push button option available. The motor is pre-installed into the roll-up tube with a 15m long, 8mm diameter, 7 core YY control cable fed into the control panel. The cable can be extended using standard 10amp electrical connections, but the overall cable length should be limited to 30 metres. 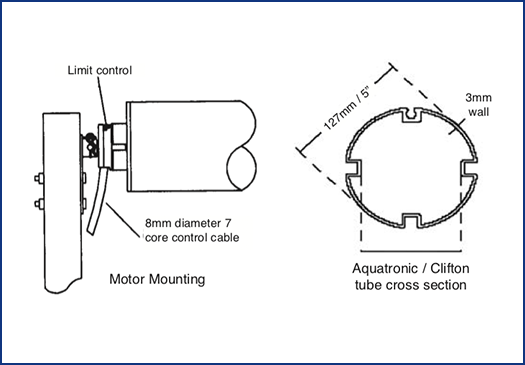 Please ask at the point of order or specify on the Aquatronic Roller order form if extra cable is required. The control panel includes an adjustable time delay function which allows time for the user to move from the control station (either key switch, push button or radio remote) to the pool side to begin guiding the cover. The key switch and push button are adjustable up to 30 seconds, while the radio remote is adjustable up to 5 seconds. Consider when planning location of the control station. The key switch is a 3 position ‘stay-put’ switch, connected to the main control panel by a 0.5mm² standard 3 core cable (not supplied). The push button is pre wired with a 15m signal cable. If the roller system is ordered with a cover, the cover will be pre-secured to the roller and calibrated for basic start and stop position, but some fine tuning of calibration will be needed on site at point of installation. 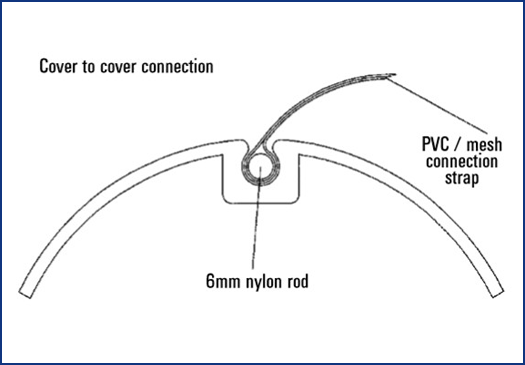 Covers are connected via a 6mm nylon rod fed through the back edge of the cover / connection piece. Please inform of distance from pool edge to final planned roller position at point of order. 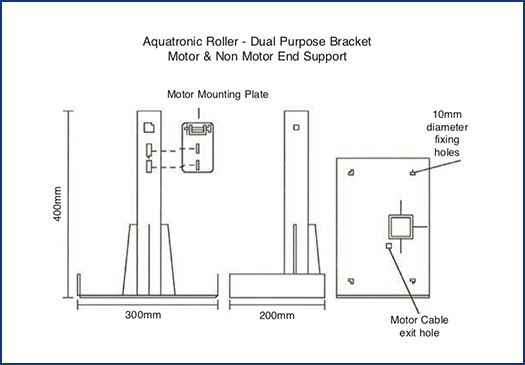 For pools with limited surrounding space, the motor mounting plate can be wall mounting for the motor/non-motor end of the roller. Pricing is for roller only. Please price for cover connection piece and towing kit separately. The Aquatronic roller is semi-automatic. 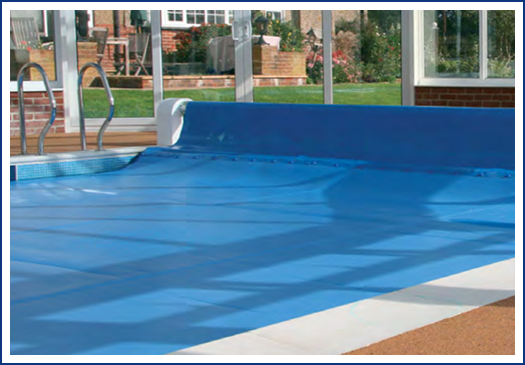 Floating covers need a towing boom and manual guidance to move them on and off the pool. 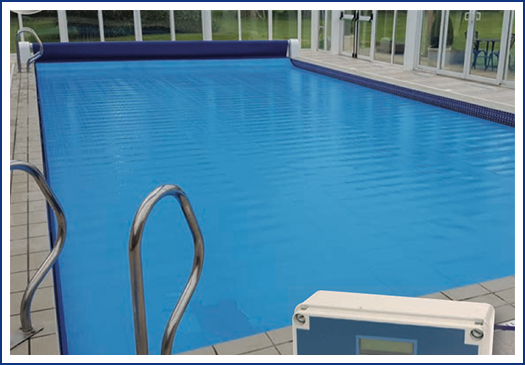 Suitable for pools of up to 15m x 7.5m or covers up to 112.5m² where the maximum width is 7.5m.